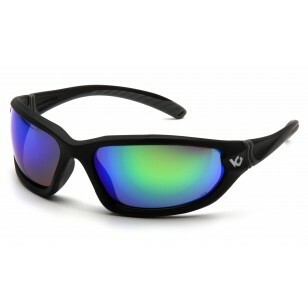 Venture Gear - Ocoee - Black Frame/Green Mirror Anti-Fog Lens IN POLYBAG - The unique properties of the copolymer nosepiece and temples allow you to conform the Ocoee to the head while retaining the shape. Sporty & unisex design. Co-injected temples and nosepiece. Foldable structure at nosebridge provides ultra comfort for extended use without slipping. Anti-fog, scratch resistant polycarbonate lens provides 99% UVA/B/C protection.